Everyone knows about the Titanic. And everyone knows about the Lusitania (read Dead Wake if you don’t). But, what about the Wilhelm Gustloff? The sinking of the Wilhelm Gustloff is the “deadliest maritime disaster in history”. So, why don’t we hear more about it? Over 9,000 people were killed in the disaster, an estimated 5,000 of them being children. In Salt to the Sea, Sepetys tells the story of the Wilhelm Gustloff through the eyes of 4 young refugees who have come together in one way or another to make the trek to the coast to flee the Russians and be taken to Germany by boat. Joana: a nurse’s assistant, carrying a secret guilt about what happened to her family when she left Lithuania 4 long years ago. Guilt is a hunter. Florian: an art restoration apprentice on a mysterious errand, and carrying a secret in his backpack. Fate is a hunter. Emilia: a young Polish girl, terrified and alone, running for her life. Shame is a hunter. Alfred: a young Nazi-in-training who recites letters of self-grandeur in his head to a girl back home. Fear is a hunter. Just when you think this war has taken everything you loved, you meet someone and realize that somehow you still have more to give. The alternating points of view between the characters. I usually like this form, but in this case it really showcases the interactions between a group of strangers who are trying to make it out of a terrible situation. They want to be able to rely on each other, but it is hard to know who to trust. That this small group of refugees are from vastly different backgrounds and experiences, yet so much the same. The characters are young. Not so much because it shows how capable and brave young people can be, but also because it shows the reality of so many young people during the war, or even now; they are alone, and have to rely on themselves. One of the narrators believes in the Nazi cause. This gets us inside the head of a Nazi, so we can get a look at some of Hitler’s ideas. It also illuminates a striking comparison between his character and the others. The other characters in their small group of refugees: Eva, Ingrid, the Shoe Poet, and the Wandering Boy. The diversity in their group highlights the fact that your circumstances during the war could make the difference between life and death; Ingrid’s blindness, Emilia’s heritage, the Shoe Poet’s age. Together the group finds ways to help each other make it through. *Thanks to the publisher for providing me with a copy of this book for review! 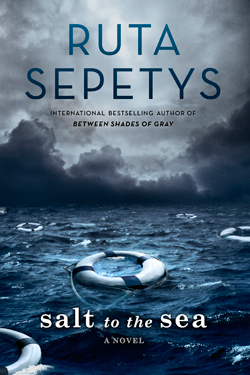 This is Ruta Sepetys‘ third book. Her first, Between Shades of Gray, is also a WWII story. 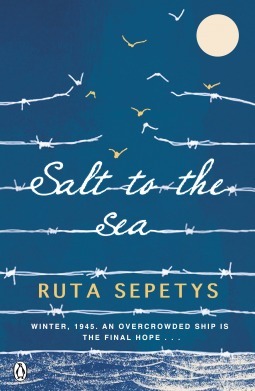 Both books were inspired by Sepetys’ family history and her father’s story as a Lithuanian refugee. I think I will have to read her first book, too. When the survivors are gone we must not let the truth disappear with them. Another great review. I swear you get better and better. I read Between Shades Of Grey in 2012 and I still remember it – that shows how memorable it was for me. I’m quite tempted by this one too. I was looking for it at the library yesterday, but they only had her second book, Out of the Easy. Have you read that one, as well? No, that one slipped under my radar. Love your analysis, Naomi, and I’m so thrilled to see someone else reviewing this, too. I loved this book! One of my favorites! And I love how we each selected different aspects to highlight! (http://books-n-music.blogspot.com/2016/03/a-heart-wrenching-yet-beautiful_24.html?m=1) So readable and yet so meaningful! I find YA (at least those I select to read) to be such wonderful reading experiences! Ooohhh…I can only imagine how this felt personal for you with regard to your daughter’s age being so close to one of the character’s. Best of luck in interesting your daughter in it! As I said, I can’t imagine being disappointed in this one! That’s what I keep telling her – that, even though she doesn’t usually read historical books about the war, I think she will like this one anyway! I thought I remember you saying somewhere that you read this book, but somehow I missed your review of it. Popping over to read it now! Yes, it is one I keep recommending and talking about!! 😄 Though I feel that is true of so many I’ve read already this year! It’s been a great reading year thus far. The Happy Marriage was the only one I’ve not at least enjoyed reading, but I love all the discussion it engendered! So at least it was thought-provoking and I do love that! It was definitely a good one for discussion! Um, really? I didn’t think anyone knew what had really happened to the Amber room. Yeah, I figured it was fiction, so it probably was a fictional solution. I have to admit that I had dismissed this book because it is classified as YA, which is something I don’t usually read that genre (though I have found the few that I have read very engaging, like The Book Thief or Our Endless Numbered Days). You’ve convinced me to take another look at this one, mostly because I’ve never heard of the Wilhelm Gustloff. Good luck convincing your daughter to read it! I’m also picky about YA. Like I said in my review, I often find even the ones everyone is raving about too simple or straightforward, or something. Which is fine if you’re the target audience, of course. But, now that my daughter is older, I find I like to try one out every once in a while. This is a good one for anyone, in my opinion! I hadn’t heard about this ship disaster either. Sounds like a wonderful book! I was impressed with it. I’m always a little nervous going into a YA novel, but there is no reason to hesitate it this case. I’m glad it’s not just me who had never heard of this disaster! I think I’ll have to try this one. I like how you said that sometimes in YA, characters can get on your nerves, but that in this one, they didn’t. That’s something I struggle with occasionally in YA too. Great review! That’s what I thought, too! How many other huge disasters are out there that most of us don’t know about yet?? I’d never heard of this disaster, either, which is astounding given the huge loss of life. The structure sounds excellent and a brave move to make one of the narrators a Nazi sympathiser. One thing about the way she structured is that it makes the story go by quickly. The sections for each narrator are short, and you just can’t stop turning the pages. I agree about the Nazi sympathizer. And it was a smart way to ‘teach’ the reader about the Nazi regime in a way that didn’t feel like a lecture. So well done. Great review! I dip into YA once or twice a year, and I’ll be on the lookout for this one! It’s a good one to look out for! This sounds like a fascinating book and I was a bit surprised to see that it’s YA Fiction. I’m glad it’s easy to read, accessible, yet serious and educational. I do enjoy YA novels but am put off by a some of them if their characters are not complex and the stories are simplistic. Is this a book you would want your daughter to read? It’s always nice when YA can hold your attention when it isn’t your usual bag. It’s always good when an author manages to balance making a story relevant to and appropriate for a younger age group but doesn’t hold back on the truth. I had no idea that the Wilhelm Gustoff had even existed. Thank you for teaching me something new! It might also have helped that it was a novel about WWII. I love good war novels, especially when I get to learn something new! I saw this on NetGalley a while ago and I was going to request it, until I realised it was aimed at the YA crowd. I don’t hate those books, but I’ve had to same experience with them as you in the past – the characters get annoying. But you’ve changed my mind about it! Yay! It’s still YA, (so, quick read), but I didn’t find it at all annoying. Highly recommended! I’m glad you enjoyed it. I hope you get time to read it at some point! I’ve been interested in this book since I just missed seeing the author at ALA (got their a day too late) and it sounds like it’s even better than I hoped it would be. I really like alternating view poitns too and it seems like they’re done particularly well here. They are done well. And, the story moves from one to the other so quickly, you don’t have time to forget about what one of them has been up to. Oh gosh I’m terribly ignorant of the sinking of the Wilhelm Gustloff. Thanks for the link on why it’s not known about more. Good grief they should have a PBS or History channel documentary on it. It sounds totally ghastly to target a ship with so many thousands of civilians on it, though I guess a lot of military officers were onboard too. Still it shouldn’t have been targeted, ugh. What a terrible loss of life. It sounds like YA reading could teach me a lot?! Isn’t it crazy that most of us don’t seem to know much about it? It helps to go into it knowing that it’s YA!